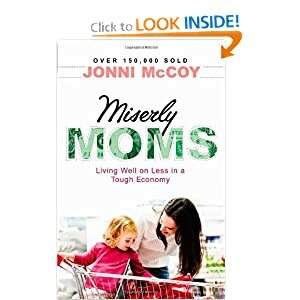 My July book to read was Miserly Moms: Living well on less in a tough economy by Jonni McCoy. I've owned this book for over a year now and just hadn't gotten around to reading it, July was probably the perfect month out of this year to do so. Last month, the company my husband works for filed for bankruptcy. It was definitely not something that was expected. We're very thankful that he's been able to stay employed there for the time being and help with the whole bankruptcy process but we'll soon have to be moving on to something else and it's always scary not knowing what your future holds. With that being said, we've had to tighten our belts a little more than normal and be even more aware of where our money's going. A lot of what's featured in the book our family already embraces, but I will say it was a nice refresher and I did learn a few new things. Jonni does a great job outlining each area of our lives where we can cut costs. Our grocery bill is one of easiest areas in which you can save money and I'm not talking about only using coupons. Sure coupons are great and can help you to get that food bill down, but regular menu planning, purchasing items that are on sale and cooking from scratch also help. We have a family of 5 and I aim to spend around $60 each week at the store. Some weeks I spend more and some I even spend less. I don't coupon much either. I strive to stick to a menu plan each week; before I do my grocery shopping, I scan the weekly sales flyer's to see what's on sale. I make sure to stock up on items that are at their rock bottom price and then try to plan our meals around what else is on sale for the week. I also try to cook from scratch as much as possible, this means I don't buy very many processed foods or snacks. We try not to eat out very often, occasionally we'll order pizza or on special occasions we might take the whole family out to a restaurant. All of these things helps me to keep our grocery budget low and is part of what helps us to afford for me to work from home and be here with our kids. The author also includes many recipes for some of her family's favorite dishes but also ones for homemade cleaners and frugal craft ideas to do with your own children. I really liked how after each section she would list some books that would provide additional information on the subject she discussed. I have a few that I'm hoping our local library has available. If you enjoy reading about ways to help you lower your monthly expenses or maybe you're a mom that's hoping to someday be able to stay home with your children; I think you would enjoy and hopefully benefit from Miserly Moms. Like I said, I didn't particularly learn many new ideas or concepts but it's definitely filled with good, valuable information that I like to be reminded of. Well the hubby and I are off to hang out with some friends this evening. My parents took all 3 girls for the weekend and headed up to the river. I've been busy baking away today, take a look at these! Don't they make your mouth drool? I promise to share the recipe next week! I have always been interested in finding out how you do it. I know from working with you that you are a wonderful mom. I have started to save money in our budget by making our own laundry soap and very eager to find out where else i can save on things for my family. I am sure you have some of the stuff posted on this site so i will just have to step away from FB and start reading your other 99 book review posts lol. Have a good weekend and enjoy the time you have with Josh.